I have only a handful of movies in my filmography that I'd actually categorize as stereotypical film school flicks. These are movies that are overly artsy, ambiguous, reference suicide or death, and every film student makes one at some point. They're experiments. 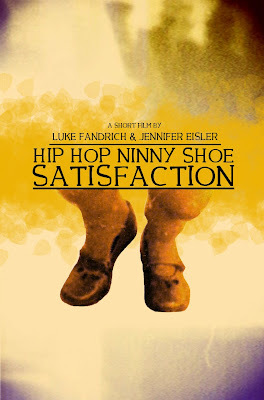 That said, Hip Hop Ninny Shoe Satisfaction is actually quite an innocent and playful short in the guise of something far more pretentious. The project was a joint undertaking with my friend Jennifer Eisler in the winter semester of 2004. We were both taking Film 202, which was a second year core production class focused on experimental film. This project specifically was an exercise in shooting with several types of 16mm film using the Bolex camera. Subsequently, my short Keys to Existence was my final project in this class. Our original concept involved comparing and contrasting various parts of the body with similar machines and their functions. It seemed like a good idea when we wrote our proposal, but come the day of the shoot we were both feeling pretty uninspired. After a lengthy and cold Regina winter we were finally starting to see the effects of spring roll in so we decided to go for a walk instead. Jen was wearing her classy 'old lady Eisler shoes' and that mixed with the melting snow, mud, sunshine, and project deadline had us going on a spontaneous whim. I started shooting Jen walking through the park, through puddles and on the playground equipment. It was honestly a big risk on our part, not only being concerned about our exposures with the film, but switching up our concept so suddenly. All I really remember about it now though, is that we both seemed to have a lot of fun that afternoon, which for me ended with a home cooked meal with the Eisler family - a big bonus after all the canned food I'd been eating in the dorms. When all was said and done, I can't really remember the screening in class, but it's likely because our final projects would've also been in the works at that time. What does stick with me is the process of how this production unfolded, and the memories created from the stress and excitment of essentially winging it. To me the title explains it all. Hip - as in artsy. Hop - quite literally jumping around. Ninny - foolish. Shoe - the subject. Satisfaction - the feeling after getting it done. Hip Hop Ninny Shoe Satisfaction, it just rolls off the tongue. I can't expect everyone to respond to this short the way Jen and I would, but for us, I think this stands out as one of our classic film school experiments. And for that, it's hard not to be nostalgic.